Admittedly, the financiers with milk chocolate filling isn't quite the prettiest thing in the world but I do love a little surprise-inside when it comes to desserts. 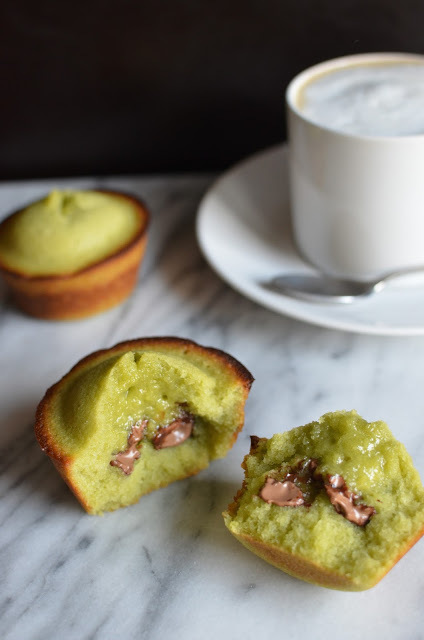 So if you're interested in trying these green tea financiers with chocolate, fill your muffin tins about halfway before tucking in a few pieces of either white or milk chocolate. Then, cover the filling and fill the tin almost to the top with more batter. I made half the recipe (3 regular-sized muffins and 4 mini's) and my family and I had fun sampling and sharing, figuring out how we preferred these matcha financiers. 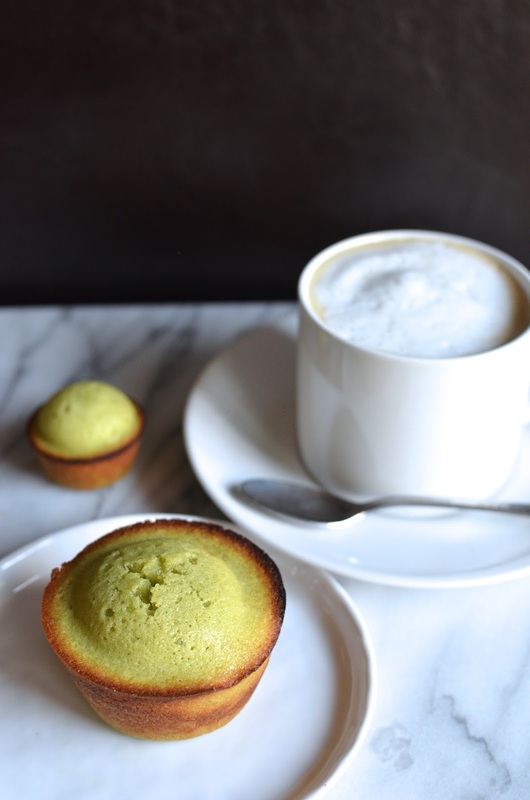 - For me, the plain matcha financiers were my favorite. They are really flavorful all on their own. Surprisingly, I liked the ones with white chocolate second-best. It's a surprise because I'm not a huge fan of white chocolate per se but in cases like this, its more subtle, blank sweetness works well. The milk chocolate ones are good but it overpowers the flavor of the matcha cake a little too much. - For my husband, he liked them in this order (from best to least): white chocolate, plain, then milk chocolate. - For the little guy, his vote went this way: milk chocolate, white chocolate, then plain. As you can see, we all had a different opinion, so it's good to have options! So do you like green tea, or matcha, flavored desserts? In writing this post, I was trying to think how best to describe the flavor of it since it isn't exactly like drinking a cup of green tea. Matcha has a kind of grassy note to it that might not sound very inviting - and maybe it's not everyone cup of tea (haha) - but I find it balances well with sweets and many people who prefer their desserts on the less-sweet side are fans of the combination. 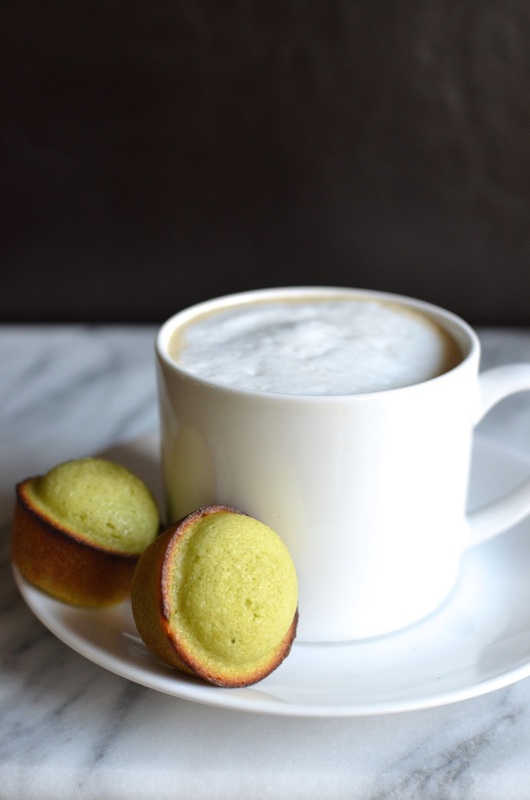 Instead of enjoying these matcha tea cakes with more tea, I went with cappuccino. Who doesn't love a little afternoon coffee break with some flavorful tea cakes on the side? Does talking about green tea desserts make you think green tea ice cream? I had to take some of my newly-acquired matcha to make a batch. Though it isn't on my personal list of favorite ice cream flavors, my husband (the birthday boy!) has always been a big fan so I was very happy to make him a homemade version. He loved it! Personally, I was wondering what green tea chocolate chip ice cream would taste like. It's so typical of me! Heat butter in a small saucepan over medium heat until it starts to boil. Let boil for 1 minute. The color may darken slightly but you don't want to brown it. Set aside to keep warm while you continue on. Whisk flour, matcha, and salt together in a small bowl. In a large bowl, stir the sugar and almond (or hazelnut) flour together with a rubber spatula. Gradually add the egg whites, stirring to moisten the dry ingredients. When all the whites have been incorporated, give the mixture a few vigorous stirs. Then, stir in the flour mixture until evenly blended. Now add the melted butter, a little at a time, folding and stirring the batter until all the butter has been incorporated. The batter will be shiny, with a pea-green color to it. Cover the batter with plastic wrap directly on top of the surface. Chill for at least 1 hour, or up to 3 days (you can bake the financiers in batches to enjoy fresh). Scoop batter into the muffins cups, filling them almost to the top. If filling with either white or dark chocolate, fill the muffin cups halfway, add a couple of chunks of chocolate, then top with more batter until it reaches almost to the top. Bake until financiers are browned around the edges, have crowned, and feel springy to the touch, about 12 - 14 minutes [In my experience, the mini cakes were done in 9 minutes while the regular-sized ones took the described 12-14 minutes]. The tops may have cracked and that's normal. Remove muffin tin from the oven, let cool a minute, then ease the financiers out. Set on a wire rack and let cool. The financiers taste best just cooled when the edges are crisp and the centers are at room temperature or still ever so slightly warm. If necessary, you can refresh leftovers the next day by warming them in a 325 degree oven for a few minutes. 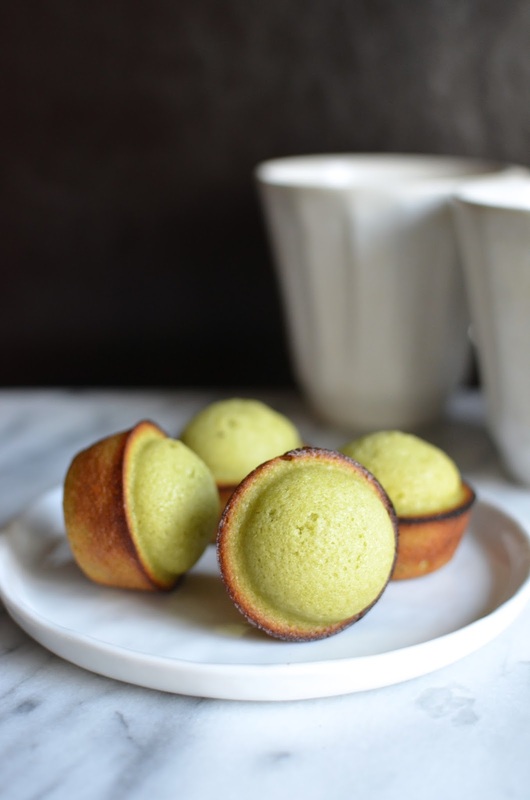 Bear in mind that oxidation may cause the matcha financiers to change color from green to yellow over time. Matcha and white chocolate are fantastic together. And now I am off to get some matcha powder to make some ice cream! haha - I immediate think ice cream when we're talking green tea desserts! Love love love!! I've made matcha financiers before and they were amazing. I didnt stuff them with any kind of chocolate, but I really should have. Genius move. This is a great post Monica. I have never tried matcha and appreciate the information. I truly value your opinion - so thanks for all the details and descriptive summary! These look amazing and the crispy crust sounds addictive. Have a lovely week! You are so sweet, Tricia. Glad you found it interesting. The crust on these financiers (when they are fresh) is worth fighting for! Same here...I have wanted to for ages but never seemed to find it or remember to look for it. I just decided to order it and here we are. I'm glad I did. Wow these are amazing. I love the matcha!! These are lovely little treats and matcha must have given them a very unique taste! Yes, it's hard to describe but definitely a nice change! I love using tea in muffins and such - it adds such a great depth of flavor that is so pleasant! These look absolutely tasty, Monica! YUM! I've had earl gray cookies but can't remember ever having other things infused with tea. I'm missing out! These are gorgeous, the Matcha is such a fantastic idea!!! lovin matcha all the way!!! lovely to starting a day with your matcha finaciers, matcha whipped cream made it perfect for me..
Matcha whipped cream?! Love how you think! Looks delicious! Loved the pics too.. This is gonna sound weird but I LOVE green food and drinks. They make me happy :) I keep meaning to pick up matcha powder but I forget every time I'm at the store. NEED to try this! I'm so excited that you grab a can of matcha powder. That means... MORE matcha recipes coming right? :) I love everything matcha (and red bean), so this is going to be a nice treat for me! Thank you for your kind mention/link. You're so sweet!! xo I have so many things that I want to make from your site, and this is just one of them. 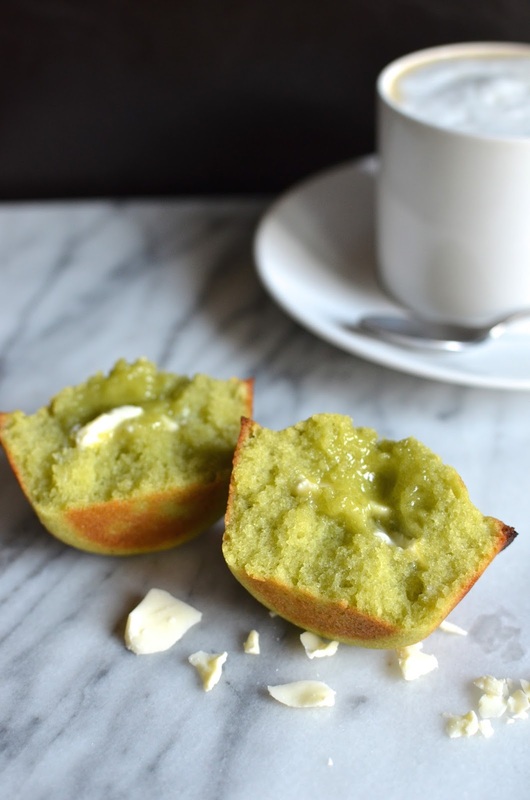 Matcha financiers... wonderful! Hi Monica, I have been so curious about matcha, these look delicious! As I learned, make sure you buy "culinary grade" matcha for baking if you do want to give it a try one day. Thank you! I was the same way - would enjoy matcha treats and want to bake with it at home but always kind of forgot about it. It was great to finally try it! Thanks, Karla - have a great day. Oh Monica, these financiers look fabulous and I love the idea of the chocolate in it...so delicate! these look so dainty and lovely! I love what I see here Monica! We are thinking of the same things again (which really does not surprise me anymore):-) Yes, green tea does remind me of green tea ice cream and I would have never thought of adding green tea to financiers. So clever also with the idea of trying out different combinations. The cut-up picture is so gorgeous,,,makes me want to grab one! I remember being at Angelina in Paris, seeing a row of financiers lined up - including green tea! While the filling is not traditional, it's a fun twist. Thank you! I am an avid green tea drinker but have never had matcha!! These cute, pistachio coloured financiers look divine Monica. I think I would appreciate the subtle matcha flavour with the White chocolate combination. Definitely a combination to try. Tres chic Monica! These matcha financiers are so cute! Especially the mini ones. I love your experimentation with milk chocolate and white chocolate fillings; surprise insides are always super fun. I wonder if dark chocolate filling might be less overpowering?